Max Hazzard hit a running jumper with less than 10 seconds remaining in overtime to lift UC Irvine to a 75-74 win over Hawai’i at the Stan Sheriff Center. Hawai’i dropped to 11-7 overall and 2-2 in the Big West Conference. The Anteaters improved to 16-5 and 4-1. 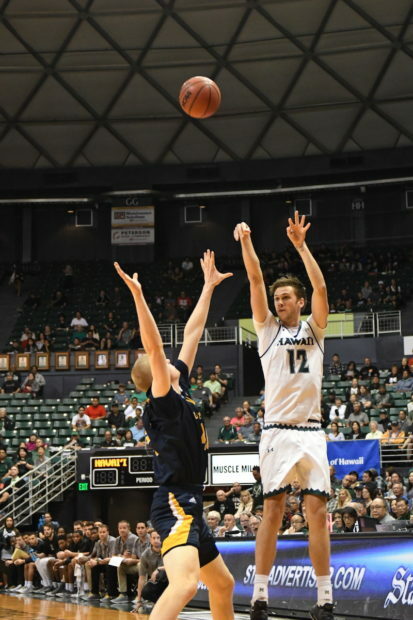 Jack Purchase led the Rainbow Warriors with 18 points and seven rebounds. Zigmars Raimo added 16 points and six rebounds, and Leland Green scored 10. After Hazzard’s go-ahead basket, the Warriors had one last possession, but Purchase missed a long 3-pointer. The game went back and forth early, but a 9-0 run by the Warriors late in the first half helped give them a 29-23 advantage at intermission. Purchase hit two 3-pointers, and Leland Green scored on a breakaway layup to highlight the surge. Purchase had 14 points in the first half, including 4-for-5 shooting from 3-point range. Green, who did not play in the previous two games, scored four points off the bench in the first half. Hawai’i increased its lead to 39-30 after Stansberry hit a 3-pointer with 14:30 remaining. Midway through the second half, the Warriors hit 3-pointers on four consecutive possessions – two by Green, and one each by Stepteau and Samuta Avea – to increase their lead to 53-39 with 8:36 remaining. The Anteaters responded with an 11-2 run late in the game to cut the UH lead to 58-57 with 2:40 remaining. UCI finally caught the Warriors with 1:02 remaining when Leonard drained a 3-pointer to tie the score at 62. On UH’s next possession, Eddie Stansberry missed a 3-pointer, then was called for a foul on UCI’s Hazzard in the scramble for the rebound. Hazzard drained both free throws to give the Anteaters a 64-62 advantage. Sheriff Drammeh re-tied the score at 64 by hitting two free throws with 25.8 seconds remaining. Both teams missed long 3-point attempts in the closing seconds of regulation. The Warriors’ next game will be on Saturday, when they host UC Davis in another Big West game.